Coming off an overtime defeat at Newton on Tuesday, the Salina Central boys basketball team was hoping to close out a victory to honor coach Doug Finch, who was being honored in front of a packed house at the Brickhouse. Instead, it was déjà vu all over again. Campus erased an 12-point deficit in the fourth quarter, sophomore Caden Kickhaefer’s last-second heave was blocked, and Central fell to the Colts, 68-65, in overtime Friday. The Mustangs lost in overtime for the second consecutive game while the Colts ended a two-game skid. Central (10-4, 3-4 AVCTL-I) came out focused, outscoring Campus 18-8 in the opening quarter. Campus came back, trimming the margin to three before Central pushed the advantage out to 30-19 at the half after 10-2 spurt. The size of the cushion would remain the same following the third quarter until the Colts charged back. Campus (11-4, 6-1) changed the lead for the seventh time when junior Shawn Warrior converted on a three-point play with 11.6 seconds left, putting the Colts on top 58-57. SC senior Harper Williams raced down the floor and attacked the rim, drawing a foul with 2.9 seconds to go. He missed the first, but hit the second, sending the game into overtime. Central was up on Campus just once in the extra period. Williams recorded all seven points in the overtime period, nailing a trey with 42 seconds remaining, bringing Central to 66-65. Campus junior Steele Chapman was fouled a few seconds later, going 1-of-2 at the free throw line, giving Central hope. Salina Central senior Brogen Richardson had a chance to tie the game, but his drive and shot was wiped off the board after a charge call. Still, Campus allowed the Mustangs to get one more chance, but Kickhaefer’s shot was blocked. Williams recorded a season-best 26 points while Kickhaefer and senior Ben Driver added 10 points each. Campus was paced by Warrior, who ended up with 22 points. Salina Central hosts Hutchinson next on Tuesday. Pregame begins at 5:45 on Sports Radio 1150 KSAL. The Mustangs made it very clear that they wouldn’t lose their fourth straight game. 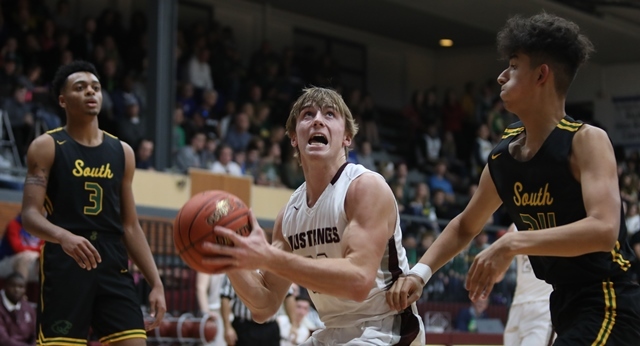 Salina Central (8-6, 4-3 AVCTL-I) scored the first seven points before Campus made the next two baskets. Central answered with a 16-0 run to close out the first quarter, putting the Mustangs up 23-4. Campus (3-11, 1-6) didn’t go away, however. The Colts trimmed the deficit down to 13 in the fourth quarter before the Mustangs made shots down the stretch. Freshman Aubrie Kierscht led the Mustangs with 22 points, including six threes. Classmate Hampton Williams added 10 points. Campus had freshman Tya Tindall, senior Camryn Huggans and junior Kelsey Huggans with 10 points each.